Sources in Prime Minister Binyamin Netanyahu’s office shot back at comments made by Likud MKs, criticizing Netanyahu’s proposal to have Jewish residents of Judea and Samaria live under the Palestinian Authority (PA). 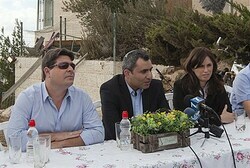 The Likud opponents to Netanyahu’s plan include Deputy Minister of Transportation Tzipi Hotovely, Deputy Defense Minister Danny Danon, Deputy Foreign Minister Ze’ev Elkin, and Deputy Minister Ofir Akunis. The source in Netanyahu’s office remarked that “no one is forcing Deputy Ministers Danon, Hotovely, Elkin and Akunis to stay in their posts, they can leave them any time they want,” reports Voice of Israel public radio. According to the same source, Economics Minister Naftali Bennett, who was slammed for similarly criticizing the proposal, also has the “alternative to leave the government.” The source opined Bennett would not do so now, stating he hasn’t accomplished any achievements in office yet. The clash highlights a growing schism in the Likud, as several MKs including those mentioned by the source are reportedly planning a “rebellion” in the party over Netanyahu’s willingness to make irresponsible concessions to the PA. Meanwhile, MK Moshe Feiglin joined the Likud members attacking Netanyahu’s proposal, saying if Judea and Samaria were to be abandoned, Jewish residents should be left with part of the IDF. ← Mystery Blast in Syrian Port: Did IDF Strike S-300 Missiles? 'In 2017 we're going to The Hague' Close associate of PA chairman says the PA will stop using violence to fight Israel and instead will sue Israeli commanders in the ICC.